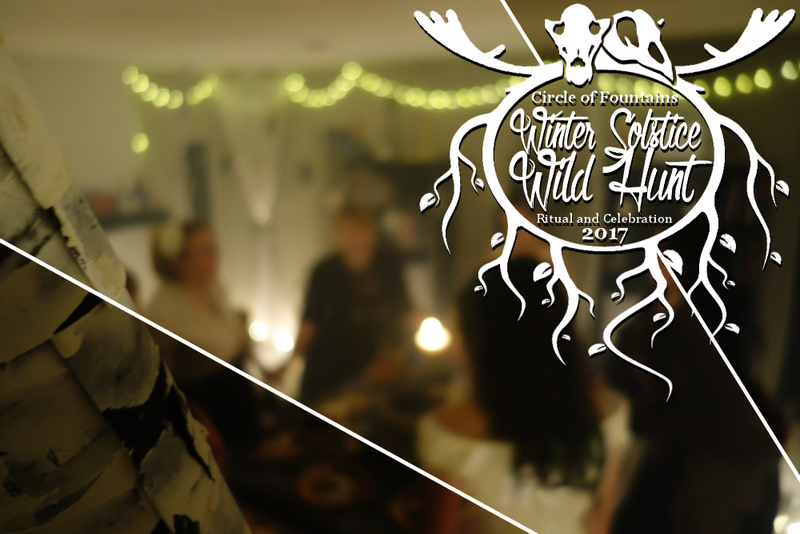 This post will cover the Winter Solstice ritual and celebration held by the Circle of Fountains. 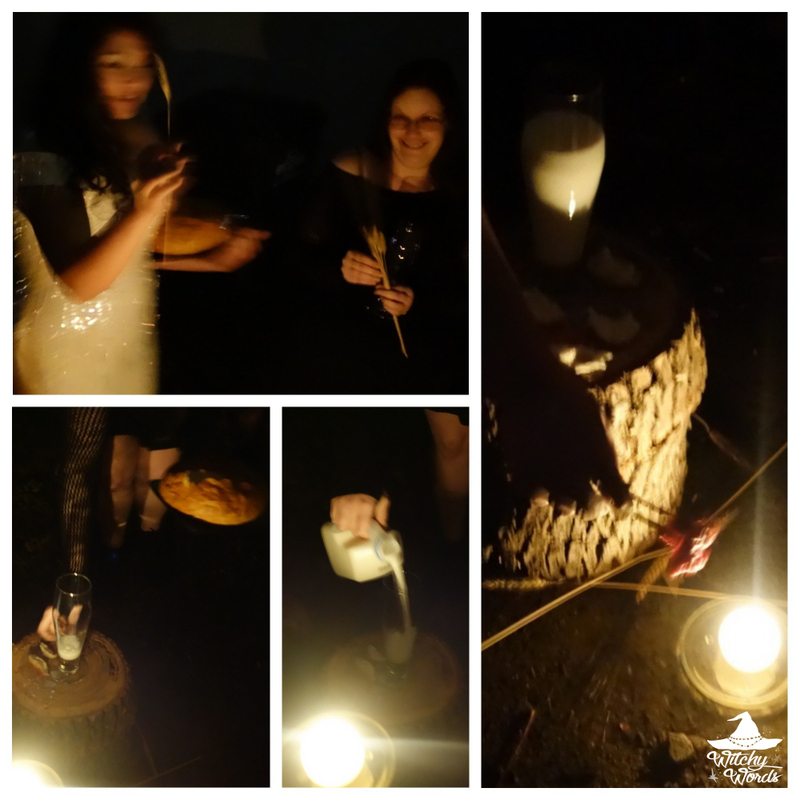 For Circle of Fountains 2016 Winter Solstice Ritual, click here! 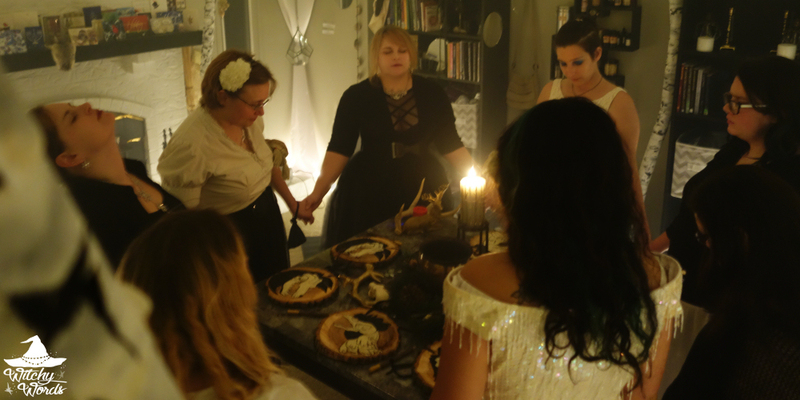 I led this year's solstice ritual! As a nontheistic hedgewitch with emphasis in Hermeticism, shadow work and spirit work, my rituals tend to aim for personal growth through grappling with inner shadows and demons. Our circle lauds differences in beliefs as each circle member has their own path that often widely differs from the next. These differences, we believe, allow us to expand our horizons and better experience the whole of what witchcraft has to offer. Our solstice ritual began by trailing outside for an altar of offerings. represents something that you grew this year that came to fruition - a major goal achieved. For me, that meant that we were able to fully renovate the exterior of our house - something I didn't anticipate being able to do in 2017.
represents a kindness, a gift or service you gave to someone this year. I sheltered one of our circlemates for six months while she fought to divorce her abusive ex-husband. represents a sacrifice you made to get where you are now this year. I sacrificed my connections and position within my local community to protect it. 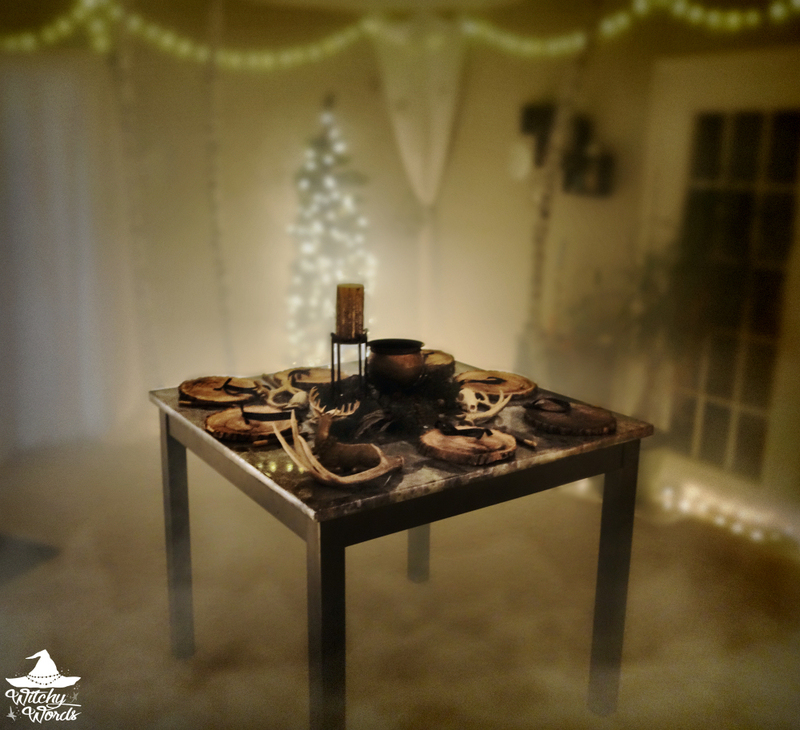 With that, our altar to the Hunt was made and we returned inside to feast! When forming our potluck, we looked to create a meal around forest-related foods. Herbs, winter roots, leafy greens, mushrooms and berries covered our plates. As we ate, we complimented ourselves on creative a cohesive meal. It was definitely delicious! We then moved on to our craft: Protective Yule balls! For this portion, I had each member fill their Yule ball with protective salt and steel nails. Then, utilizing a bay leaf, we wrote a person, entity or deity that we wanted to call upon for protection during our ride with the Hunt. That combined with a little glitter and some pine and berry decorations made for the perfect protective orb! Upon entering the ritual room, circlemates placed their protective orbs on the tree provided. ... and then joined us to circle the main altar in the center of the room. Once the song completed, an atmospheric mix of howling wind with distant barking dogs, horse hooves and neighing began. Welcome to the Wild Hunt. It goes by many names: The Infernal Hunt, the Wilde Ride, the Raging Host. Its leader differs from culture to culture, from Herne the Hunter to Hecate, Harlequin and, most recently, Odin. Its existence traverses the lands and the lore is diverse. Is the Wild Hunt the Feast of the Good Women, the Ladies of the Night who bless a house with prosperity in exchange for bread and honey? Is it the calamity of the dead with a psychopomp at the helm, chasing down lost souls in their fury and sweeping them off to some sort of limbo between worlds? Is it a carnival of demons and fairies, a masquerade of ancestors and chains? Is it the storm of a god predicting war, famine and even death in a cavalcade whose feet never quite touch the ground? The earliest accounts lead us to the Witches’ Sabbath - a dance of spirits and humans inclined in the otherworldly and supernatural. In that, we find that we, as witches with one foot in the Other, belong with the hunt. We have nothing to fear here. We are the hunters, the spirits, the vessels, the dance and the void. We are the ones to be feared. And so, upon this night, we rode! We called upon the Wild Hunt and its many-faced leader, be it Hecate of the Crossroads, Odin and Sleepnir, Diana the Huntress, Herne the Hunter or the Unknown Psychopomp. We asked that we, as witches and otherworldly beings inhabiting our human vessels, join the Hunter in the Hunt because we had questions that need answers, needs that necessitated fulfillment and a future to face at the turn of the upcoming new year. We call you here so that we may join your wild sweep! Themes of death and rebirth are as strong in the Hunt as they are in Yule. The Hunt encompasses both the living and the dead, and offers both gifts of prosperity and the collection of souls. The Hunt can both give and take. If it gives, it is only in necessity. If it takes, whatever is taken will never return from the Beyond. With that in mind, each of my circlemates that night were instructed that they would ask for the fulfillment of a need by the leader of the Hunt. If you choose to do this yourself, approach with caution. Ask for too much or for something too frivolous and the Hunter will surely cut you down and take your soul. A common theme within the hunt is the black dog and the white rooster. The barking of the black dogs of the hunt symbolize the vengeful predator coming to kill its prey. These dogs represent death. And the thrice crow of a white rooster would bring an end to the hunt and the longest night. This rooster inevitably represents rebirth or life. Before my circlemates sat large plaques of wood. I asked them to think about which piece they wanted and situate themselves as they needed. Then, when they were ready, they could turn their piece over. Each circlemate received either a black dog or a white rooster on their plaque. If they received a black dog, it represented a needed death or loss, a removal of something within their life. If they received a white rooster, that represented a rebirth, a renewal, a growth or light they needed to bring into their life. Death and rebirth. Giving and taking. The black dog and the white rooster. The longest night leading into the birth of a new day. The Wild Hunt is about dichotomies, two halves of the same whole, two sides of the same coin. These mirror images play themselves out in many ways. In many reports of the hunt, participants would wear masks to join the calvary only to meet another being with the same mask. This double could have many true forms: Perhaps it’s an ancestor, someone you recognize only after noticing their clothing. Maybe it’s astral double, a second version of you that exists on the non-physical plane. Perhaps it’s yourself in the Other, yourself as you are when you pass, because we know time behind the veil is never linear. Your Double could be your patron deity, a familiar spirit, a faery, demon, angel or more whom you connect with. This Double can tell you things only an otherworldly being could know. They can predict your death, give you guidance for the future and find secrets never disclosed to you. Within the forest of birch trees surrounding my circlemates were mirrors. I asked them to look around, to find their Double here with us that night. By finding them in the mirror and talking with them, they could gain more insight into the need they needed to communicate with the Hunter. They already had a start: They knew they either needed to release or receive. Now their Double would guide them the rest of the way. After talking with their Doubles, circlemates were instructed to return to the altar and, utilizing paper and wood pencils, they would write down their "statement of need." Once everyone returned to the altar, we read our statements aloud and awaited the coming of the Hunter. And then the toll of the bells sounded. The dragging of chains could be heard and the growling of a ferocious dog neared. Among the living and the dead, the Doubles and the witches, one figure looms above them all. Upon a white stead and surrounded by black dogs, the Hunter takes on many forms, including Hecate, Diana, Harlequin, Herne, Odin and more. Or perhaps the figure is an unknown psychopomp ushering souls with him to and from the Other. Whatever the identity you choose, stories tell of meeting the Hunter at the crossroads to request the fulfillment of a need. By calling upon the quarters and placing mats in the proper directions of the ritual room, we created our own crossroads. Lo, the Hunter approaches! There are rules to meeting the Hunter. Do not look at the figure. Do not converse with the Hunter. I asked my circlemates to avert their eyes and quietly offer their statement of need to the flame. And so the Hunter left - and with her, she takes the Hunt: Your double, the spirits, ancestors, fae and deities that that encompasses. From here, the days grow longer and the light returns once again. This ritual allowed us to travel through the underworld, through the Other, for the final time during the dark season. We simply await the crowing of the rooster. The thrice crow of the rooster echoed throughout the room. Circle of Fountains wishes you a most blessed Yule as we welcome the return of the light! Thank you so much! Everyone in the circle has a different approach to leading sabbat rituals. That's what makes our circle so unique! I'm certainly glad you liked it though! I would totally buy a wood circle with a white rooster or black dog on it. A beautiful ritual. I practice as a solitary but feel a spiritual connection to your CoFs. I check your blog regularly and appreciate all your experiences and ideas. Thank you for sharing! Thank you so much, Stephanie! That means so much to me and Circle of Fountains. We truly appreciate it!